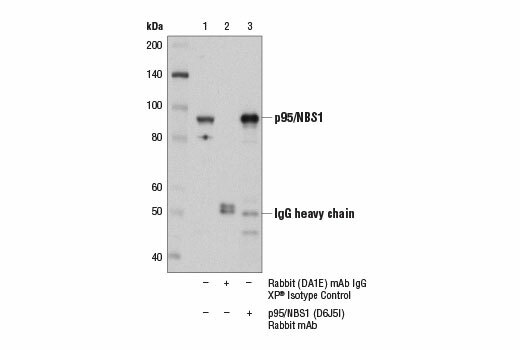 p95/NBS1 (D6J5I) Rabbit mAb recognizes endogenous levels of total p95/NBS1 protein. 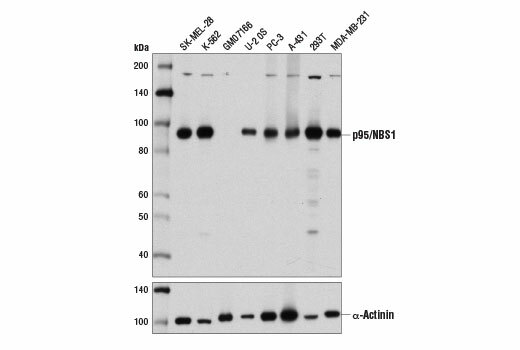 This antibody also cross-reacts with an unidentified protein of 180 kDa in some cell lines. 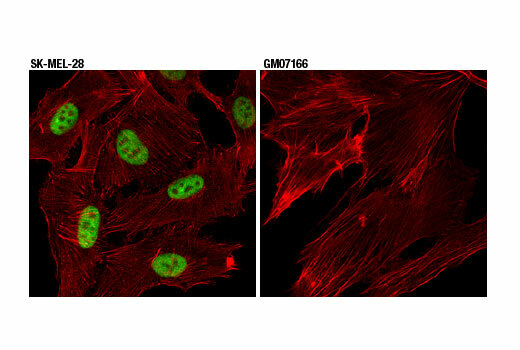 Monoclonal antibody is produced by immunizing animals with a synthetic peptide corresponding to residues surrounding Ala740 of human p95/NBS1 protein. Nijmegen breakage syndrome (NBS) is characterized by growth retardation, mental disability, immunodeficiency, defects in cell cycle checkpoints, an increased propensity for cancer, and sensitivity to ionizing radiation (1). Repair of radiation-induced DNA double-strand breaks is dependent on the multifunctional MRN complex containing Mre11, Rad50, and the NBS1 gene product p95/NBS1 (also called p95 or nibrin) (2). p95/NBS1 is a protein with a forkhead-associated domain and a BRCT repeat that regulate interaction with MDC1 and are essential for proper G2/M DNA-damage checkpoint function (3). NBS1 is critical for homologous recombination following DNA double strand breaks. This activity requires CDK-dependent association with CtIP and subsequent phosphorylation by ATM (4). ATM interacts with and phosphorylates p95/NBS1 at Ser278 and Ser343 after exposure to ionizing radiation (5,6). Chrzanowska, K.H. et al. (2012) Orphanet J Rare Dis 7, 13. Lee, J.H. et al. (2013) J Biol Chem 288, 12840-51. Hari, F.J. et al. (2010) EMBO Rep 11, 387-92. Wang, H. et al. (2013) PLoS Genet 9, e1003277. Wen, J. et al. (2013) Oncogene 32, 4448-56.